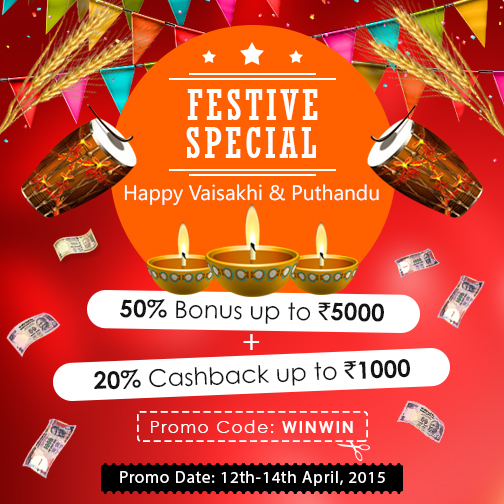 Junglee Rummy, one of the fastest growing platforms for online 13 cards rummy games has announced a new promotion in the festive event of Vaisakhi and Tamil Puthandu. You can get a huge deposit bonus and cashback on these festive days that will start from 12th of April until 14th April 2015. Play online rummy for cash at Junglee Rummy, make a minimum deposit of Rs.500 and get 50% bonus up to Rs.5000. Use code “WINWIN” while making your first deposit of the day to claim your bonus. The happiness of playing rummy card game online doesn’t end there. You can get also avail your 20% cashback up to Rs.1000 when lose your deposit playing cash rummy in the promo period. The Festive Special Bonus and Cashback offer from Junglee Rummy will run from 12th April 00:01 hours to 14th April 23:59 hours. Don’t let this amazing opportunity slip away. Make a deposit today and grab the festive offers to play online rummy for real cash in the best way possible. Subscribe to us and be the first one to know about the best online rummy promotions, bonuses and offers. If you have any suggestions or feedback, feel free to post it in the comment section below!